He’s more concerned about post-match speeches than decoding the South Africans’ gameplan. Jamie Heaslip leads Ireland for the first time. 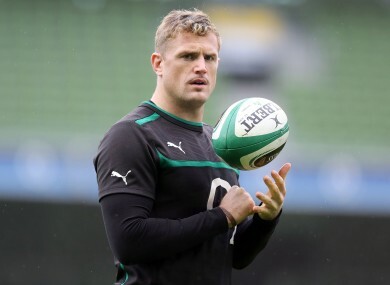 THREE DAYS INTO the job as Ireland captain and Jamie Heaslip is already eager for a little less conversation and a little more action… please. Questions on personal form and direct opponents are buried with queries about the handling of high balls by the fullback, player recruitment policy and insights into the secret world of ‘the front row union’. With Ronan O’Gara in the matchday 23 and Paul O’Connell, Leo Cullen and Brian O’Driscoll a quick phone-call or tweet away, Heaslip can call on a sizeable captaincy brain trust. However, the Leinster forward is not quite preparing a dossier on the South Africans. “I asked the guys for a bit of a heads up, on what’s extra I suppose,” he told TheScore.ie. “Talking after the meal and stuff like this. “All before the game, nothing changes. Nothing changes at all. Today’s match will be the third time that Heaslip has faced the Springboks. He was immense in the Croke Park victory in 2009 and part of an outgunned pack at the Aviva 12 months later. The Aviva will be very close to full come kick-off but it has rarely rocked, be it football or rugby, since it reopened with a swooping roof and extra room beneath the stands to swing a beer and ketchup a hot-dog. Heaslip has a reputation for backing his pack, and himself, when penalties are offered in range of the posts but insists he can be trusted to make the right call if the match comes down to a late shot at the posts. With Sean O’Brien and Stephen Ferris both missing from the Irish backline, Heaslip may be asked to reprise the ball-carrying role that defined his first two seasons in the Ireland jersey. On the contrary, argues the captain, as he named six of the front-eight that would be better suited to take the ball and run [hard luck Mike Ross]. They’re big, they’re strong and they want to run over you. Make no bones about it, they want to run over you, they want to run through you and then get their backs to run around you on the edge. We’ve got to front-up. Win the collisions, win the gain-line when we can and try and then get the ball back and put some pressure on them. Thoughts of post-match speeches, handshakes, and prize-draws may have occupied Heaslip during the week but his provincial colleagues were quick to remind him of his unbeaten streak when leading sides. Email “They’re big, strong and they want to run over you – captain Heaslip on the Springbok science”. Feedback on “They’re big, strong and they want to run over you – captain Heaslip on the Springbok science”.